If you’re looking for free things to do while you’re in New York City, you’re in luck! There is plenty to see and do for nary a penny in the Big Apple. I love New York City. It’s one of my favorite cities to visit. Not surprisingly, it’s also one of the most expensive places I’ve ever visited. But, of course the grandeur, culture, and vibe of the city are all worth the cost of visiting. The only challenge for me is that I’m usually on a budget whenever I take a trip to the Big Apple. So, I’m always looking for ways to save money in New York City. Fortunately, there’s a lot you can do in the city without even having to fork over a dollar. 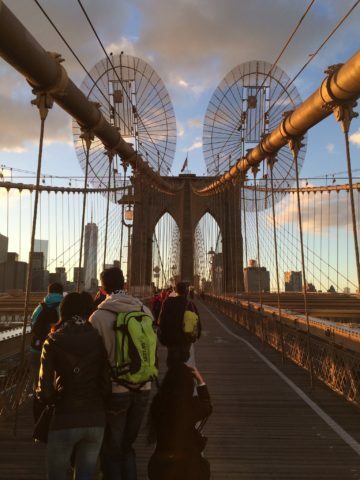 #1 – Walk the Brooklyn Bridge. This is one of the best things I’ve ever done while visiting New York City! A walk across the Brooklyn Bridge is completely free. The pedestrian path itself is about 1.1 miles long. Walk both ways, and you’d log 2.2 miles of scenic exercise. But a 2-mile trek back and forth across the Brooklyn Bridge really isn’t that physically taxing for those who walk a brisk pace 30 minutes to 1 hour every day. Allow between 60 and 90 minutes to make the walk during high-traffic times. A lot of commuters and tourists walk the Brooklyn Bridge every day, so it can be slow going along some of the narrower parts of the bridge. Time your walk around sunrise or sunset for some stunning views and the chance amazing photo opportunities! #2 – Go to free TV show tapings. My family and I once appeared on The Today Show during one chilly morning in November 1995. We stood outside among a few dozen others watching the popular NBC morning show get taped. We even were treated to an outdoor home improvement demonstration by Norm Abram of This Old House fame, taped live right in front of us. 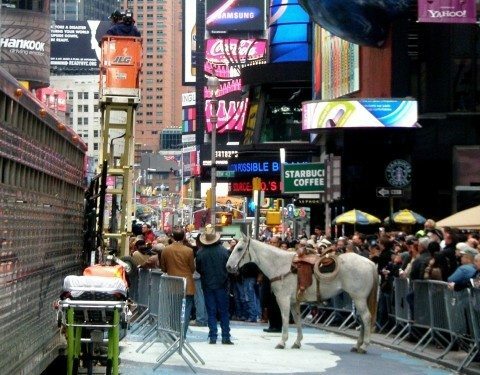 Many shows are taped each and every day in New York City — most of which offer free tickets so you can be part of the audience! While many programs, like The Daily Show, The Tonight Show, Saturday Night Live, and other programs usually require you to enter lotteries or reserve seats months in advance, most offer day-of standby tickets. If you plan to join a studio audience of any live show tapings, be sure any kids that you may have in tow are old enough to attend. Many taped TV shows have minimum age requirements for members of their studio audiences. #3 – Visit Central Park. When you’re in the hustle and bustle of Manhattan, a trek through Central Park can immediately put you at ease again. Central Park is located in the heart of Manhattan, between 59th Street and 110th Street. There are so many things to see and do in Central Park — from the ponds and foot bridges to street performers and public events. My favorite spot in Central Park is the Bethesda Fountain and Bethesda Terrace area. What a scenic place to enjoy some downtime! #4 – Stop by Federal Hall. If you’re a history buff (I certainly am), then a visit to Federal Hall should be on top of your list of free things to do in NYC. Located caddycorner to the New York Stock Exchange building on Wall Street, Federal Hall was built in 1703 and served as the first capitol building of the United States. It’s also where George Washington took the oath of office to become our nation’s first president. #5 – Ride the Staten Island Ferry. The Staten Island Ferry for commuters is absolutely free and provides terrific views of New York Harbor and the Statue of Liberty. While this isn’t the same trek as the popular Statue of Liberty ferry tour, the commuter line is still one of the hottest things to do in New York City for free. Hop aboard in Lower Manhattan at the east end of Battery Park. Once you reach Staten Island, all you need to do is hop back on the ferry for a trip back to Manhattan. #6 – Visit the Cathedral of St. Patrick. In the middle of Manhattan is one of the nation’s most beautiful and serene houses of worship — the Cathedral of St. Patrick, more widely referred to as St. Patrick’s Cathedral. This Catholic church, opened in 1879, is a destination not only for Christians, but for all who want to enjoy a spiritual uplift. Those who visit the St. Patrick’s Cathedral are sure to admire the landmark’s Neo-Gothic style architecture, soaring ceilings, and classic artistic touches. #7 – See the Chelsea Galleries. Chelsea, one of New York City’s trendiest neighborhoods, has a ton (literally) of art shops, boutiques, and vendors. Trek through Chelsea on any given day — or evening — and you’re bound to catch an exciting array of artistic works on display, ranging from canvas works to sculptures, and much more. The Chelsea Galleries are located between 10th Avenue and 11th Avenue along most of the streets numbered in the 20s. #8 – Swing by City Hall. New York City Hall is more than just the seat of government for the nation’s largest city — it’s also an amazing place to spend some time as a tourist. Built in 1811, New York City Hall features a blend of classic architectural influences, including French Renaissance, Renaissance Revival, and Georgian. New York City Hall is located in Lower Manhattan in City Hall Park — which is situated between Park Row, Broadway, and Chambers Street. 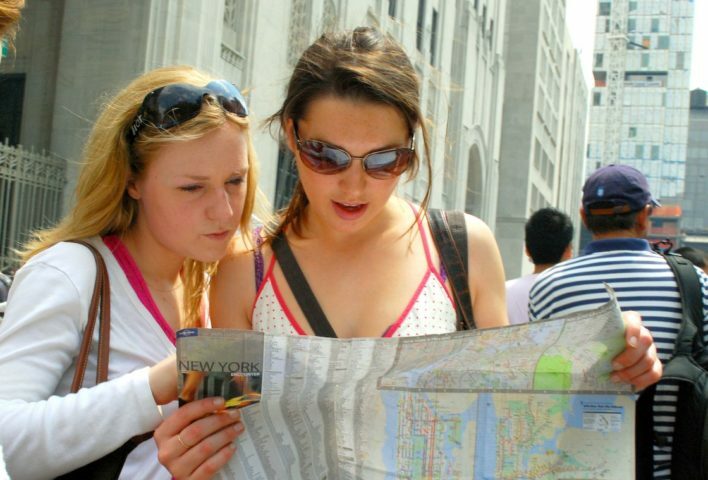 #9 – Stop in at the Federal Reserve Bank of New York. In the heart of New York City’s Financial District is the Federal Reserve Bank, which distributes paper currency with the “B” district letter and “2” district number on the notes. The New York Federal Reserve does much more than help put paper money into circulation. It, along with the other 11 Federal Reserve Banks located throughout the United States, does everything from clear checks to store bullion. In fact, there are 10,000 tons of gold in the heavily secured vault some 80 feet below the Federal Reserve Bank in New York! There’s also a display on counterfeit currency and a major coin collection. You’ll need to take a tour to get into the New York Federal Reserve Bank. It’s best to make reservations as soon as possible, since tour spaces fill up quickly. #10 – Walk the High Line. The High Line is a 1.45-mile-long linear park that has become one of the most popular trails in all of New York City. This unused, converted elevated rail line extends from Gansevoort Street to 34th Street in eastern Manhattan and attracts some 5 million visitors each year. Along the way, you’ll see incredible views of the Hudson River and canyons of skyscrapers. The High Line also features greenspace with more than 200 types of plants. #11 – See the Rockefeller Center’s public art. Traipse by Rockefeller Center in midtown Manhattan and you’ll find an impressive collection of Art Deco sculptures and motifs paying homage to science, technology, and culture. One of the most recognizable pieces of art in the Rockefeller collection is Atlas — a figure from Greek mythology who holds the globe upon his shoulders. Rockefeller Center is located at 45 Rockefeller Plaza, caddy-corner from St. Patrick’s Cathedral. #12 – Pay homage at the World Trade Center National 9/11 Memorial. I’ve seen a lot of places and been to a lot of landmarks in New York City, but none so moving as the World Trade Center National 9/11 Memorial in Lower Manhattan. 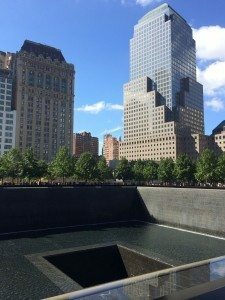 The World Trade Center Memorial is located on the exact footprints of the former World Trade Center Twin Tower buildings that were demolished during the 9/11 terror attacks. Two square pools sit where the World Trade Center towers once stood, and along the sides of each pool are inscribed the names of people who died. Nearby, a forest of trees grow. Just steps away stands the new One World Trade Center — also referred to by some as the Freedom Tower. The National 9/11 Museum is located on the eastern side of the 9/11 memorial. #13 – Look at the art in Socrates Sculpture Park. Just across the East River from Manhattan is Socrates Sculpture Park, located in Long Island City, Queens. You’ll find an eclectic and ever-changing array of art at Socrates Sculpture Park — much of it consisting of life-size (or bigger-than-life) pieces located throughout the grounds. Some art hangs among the trees, and other pieces may even be found floating atop the water of the East River. This is a great place to spend a couple hours away from the hustle of Manhattan and simply get lost in your imagination. #14 – Take a hike on the Grand Central Partnership walking tour. These 90-minute walking tours of Grand Central neighborhood are free, require no reservations, and are a lot of fun! So, what exactly will you get to check out if you take a walking tour of the Grand Central neighborhood? You’ll get to see several Midtown East landmarks and attractions — and hear some pretty interesting (and relatively little-known) trivia about places such as the Chrysler Building, Pershing Square, the original Lincoln Memorial, and, of course, Grand Central Terminal. The Grand Tour meets each Friday at 12:30 in the sculpture court at the southwest corner of Park Avenue and East 42nd Street. #15 – See the General Grant National Memorial (Grant’s Tomb). President Ulysses S. Grant and his wife, Julia, are buried in what is North America’s largest mausoleum. The General Grant National Memorial is located in Riverside Park in the Morningside Heights neighborhood of Manhattan near Riverside Drive and West 122nd Street. While most know of Ulysses S. Grant as our nation’s 18th president (he is also on the $50 bill), what many people don’t know is that Grant was a celebrated Civil War Union general who helped bring about peace as the national war was coming to an end and during Reconstruction. He easily won 2 terms as president, serving from 1869 through 1877. #16 – Check out the New York City Public Library. Built in 1895, the colossal New York City Public Library contains more than 50 million items. Not only is the New York City Library the 2nd largest library in the United States (behind the Library of Congress), but it’s also the 4th largest in the world! The New York City Public Library isn’t just about the books though (not that I don’t love books). This amazing place also has several exhibits, including a collection of more than 430,000 maps and an original copy of the Declaration of Independence.